Katie Steckles is a mathematician based in Manchester, who gives talks and workshops and writes about mathematics. 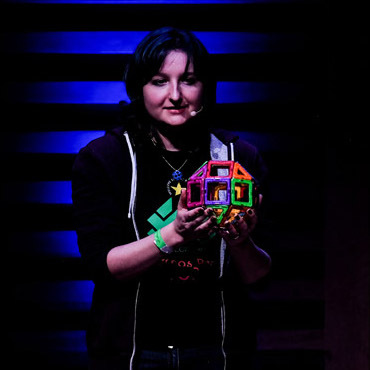 She finished her PhD in 2011, and since then has talked about maths in schools, at science festivals, on BBC radio and TV, at music festivals, as part of theatre shows and on the internet. She currently lectures part-time at Sheffield Hallam University. If you need more information, a photo of Katie for publicity, or to enquire about a booking, please use the contact details above. Katie delivers talks and workshops in schools for Think Maths with Matt Parker, engaging students with off-curriculum mathematics. 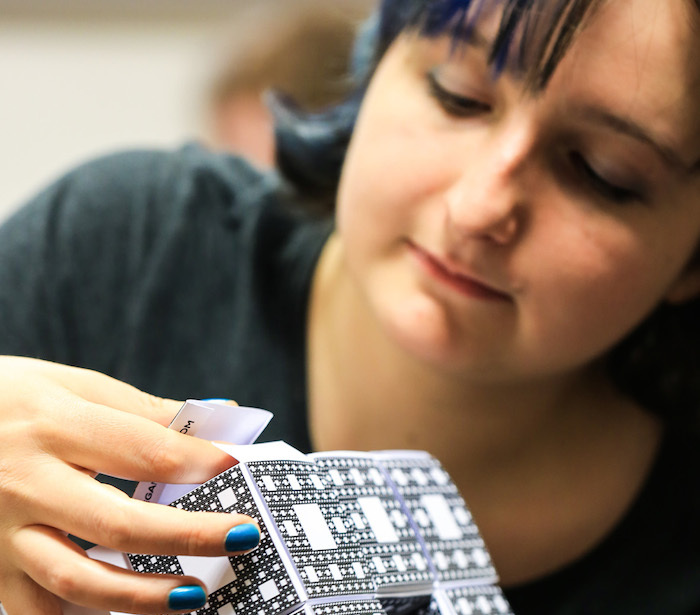 She also does admin and project management for Think Maths, and ran the Domino Computer project at Manchester Science Festival in 2012, the MegaMenger international fractal construction project in 2014, and the Mirror Pillar anamorphic art project in 2018. 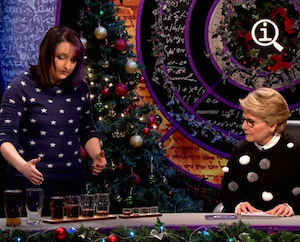 Katie appeared on the 2018 Christmas Special episode of QI, to explain a mathematical concept through the medium of beer. She has also appeared several times on BBC radio, including talking to the BBC World Service about topical maths news, guest spots for BBC Radio Manchester talking about maths puzzles, and as part of a Naked Scientists programme about the Millenium Maths Problems for BBC Radio 5 Live Science, in July 2015. She has also appeared as a guest expert in two episodes of Channel 4's SuperShoppers, on a BBC Live Lesson in January 2018, and on the Discovery Science Channel's 'Mythical Beasts' in the US. Katie is the organiser of the Manchester branch of MathsJam, a monthly pub night for people who want to share maths toys and games, puzzles and other interesting mathsy things. Katie coordinates all the organisers of over 60 MathsJams worldwide, and helps to maintain the MathsJam website. She also assists with running the MathsJam Annual Gathering. 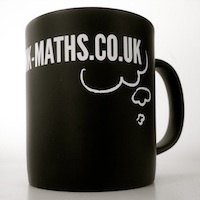 Katie blogs as part of the team at The Aperiodical, an online maths magazine. One of the site's three editors, Katie posts news and opinion pieces, as well as curating content and helping to run the Carnival of Mathematics. She also writes regular blog posts every fortnight for the Heidelberg Laureate Forum's blog at Spektrum.de SciLogs. 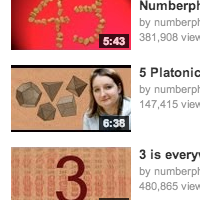 Katie has appeared in several videos on the YouTube channel Numberphile, talking about her favourite bits of maths. She's also done a few videos of her own, including one on gift wrapping which has had around half a million views. In 2014, Katie worked with Dr Peter Rowlett and the Further Maths Support Programme to produce a series of podcasts, called Taking Maths Further. Each episode features an interview with someone who uses maths in their work, plus some discussion on the mathematics, and a puzzle. The podcasts are available to listen to on the FMSP website. 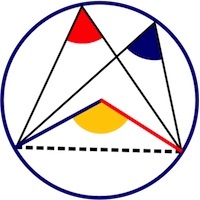 Mathematics Masterclass speaker for the Royal Institution - workshops ranging from primary age up to Sixth Form, lectures in the Ri's Faraday Lecture theatre, and sessions as part of their summer programme. Speaking at Robin Ince's Nine Lessons and Carols for Curious People events, Festival of the Spoken Nerd and An Evening of Unnecessary Detail, QED Con and Skeptics in the Pub events around the UK. Proofreading, question and puzzle writing for books, mathematical competitions and events, including So Awkward Scrapbook (CBBC TV series annual) and Tim Peake's The Astronaut Selection Test Book; programme puzzles for events at the British Library, and questions for the UK edition of the Who Wants To Be A Mathematician? competition. May 2015: Two-week 'Mathematician in Residence' placement in the Stephen Lawrence Gallery, University of Greenwich. Volunteer with Manchester Girl Geeks, managing and organising events to encourage and empower women in STEM. Part of the Maths Busking project, delivering performance and training. Mathematical theatre projects, including the19thstep's production of Everything & Nothing (later called Amelia and the Mapmaker), and Geddes Loom's Phi-based show Prelude to a Number.